The DA’s election rally may have trended on social media, but some were not impressed. The Democratic Alliance held its election manifesto rally at the Rand Stadium on Saturday and the event received criticism from South Africans, who also took to social media to voice their opinions. 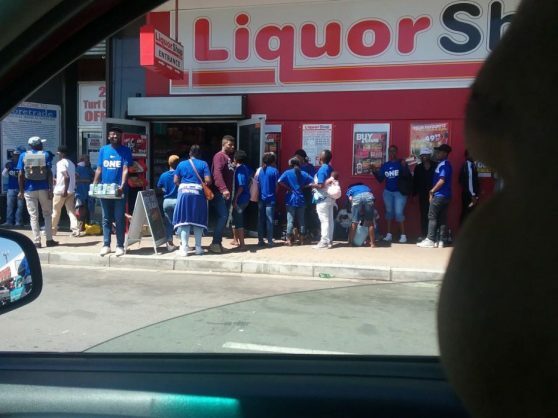 The party’s MP and shadow minister of higher education and training Belinda Bozzoli’s allegation against the EFF last year may have come back to haunt the party after some of its members were seen buying alcohol at a Shoprite liquor store yesterday. Bozzoli took to social media in October last year and shared “rumours of the EFF bribing students to vote for them with beer and parties. May throw new light on recent SRC election results. EFF deputy president Floyd Shivambu slammed Bozzoli’s tweet and accused her of “reducing thousands of black students to beer”. Bozzoli took to social media again on Saturday to comment on the DA’s “peaceful” rally that was not accompanied by “aggression, war talk and militarism”, a tweet that was perceived to have been directed at the EFF. EFF national spokesperson Mbuyiseni Ndlozi was kind enough to explain to Bozzoli why her party’s events were always peaceful, in a clap back that was praised by his followers. Ndlozi told Bozzoli: “Of course you are happy; you have all the reasons to be happy as key beneficiaries of white supremacy. DA leader Mmusi Maimane’s speech also failed to impress, with some claiming members started leaving the stadium during Maimane’s “long” speech. “The stadium is rapidly emptying as he is rambling on..
“There is only so much rubbish a human being can listen to…even for a Streetwise Two from KFC,” claimed Dali Mpofu. Hey @MmusiMaimane, why are you lying to the people ?